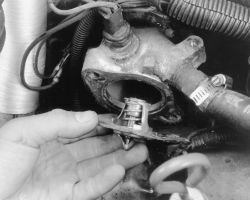 Technical Car Experts Answers everything you need: how to replace thermostat on 1992 buick century ? how to replace thermostat on 1992 buick century ? here are instructions,along with some pictures. CAUTION When draining the coolant, keep in mind that cats and dogs are attracted by ethylene glycol antifreeze, and are quite likely to drink any that is left in an uncovered container or in puddles on the ground. This will prove fatal in sufficient quantity. Always drain the coolant into a sealable container. 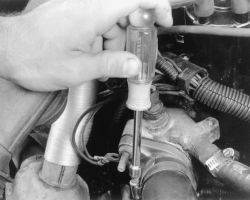 Coolant should be reused unless it is contaminated or several years old. Some models require you to remove the air cleaner assembly from the throttle body. Some models with cruise control have a vacuum modulator attached to the thermostat housing with a bracket. It your vehicle is equipped as such, remove the bracket from the housing. 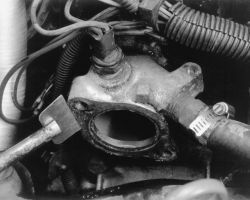 On the 4-cylinder engines, unbolt the water outlet from the thermostat housing, remove the outlet from the housing and lift the thermostat out of the housing. On all other models, unbolt the water outlet from the intake manifold, remove the outlet and lift the thermostat out of the manifold. Clean both of the mating surfaces and run a 1/8 in. (3mm) bead of R.T.V. (Room Temperature Vulcanizing) sealer in the groove of the water outlet. 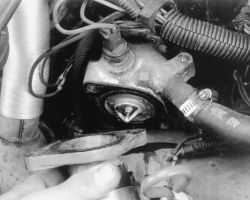 Install the thermostat (spring towards engine) and bolt the water outlet into place while the R.T.V. sealer is still wet. Tighten the bolts 17-21 ft. lbs. (23-28 Nm) on all but the 2.2L engine. Other engines tighten to 89 inch lbs. (10 Nm). The remainder of the installation is the reverse of removal. Fill the cooling system, start the engine and top off. Check for leaks after the car is started and correct as required.